Starting a numbering system while TBT is here at mmm! quilts. Welcome! 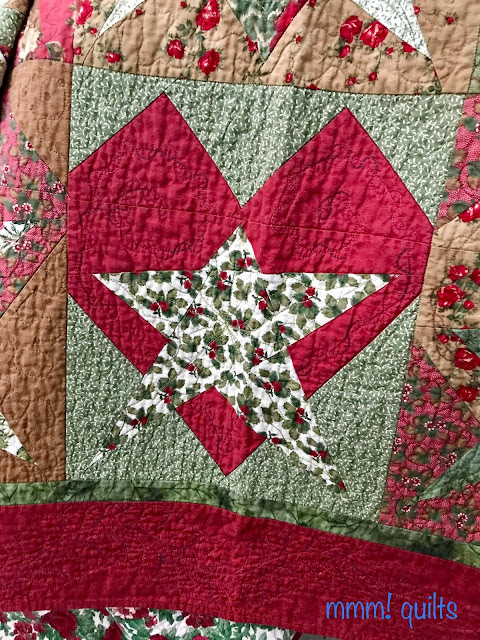 Grab a cup of coffee or tea and prepare to read the story behind my Starry Hearts, and more stories behind more pre-blogging quilts in the linky party below. It was a very overcast day so not the greatest light for these. It's also a pretty large quilt for MacGyver to hold up. Love the bump that is his head in the middle LOL! This was the first fat quarter bundle I bought, at a sewing show in Edmonton called Creative Stitches (I think). I went with my BQF (Best Quilty Friend), L. She and I got into some wonderful trouble where sewing and shopping and quilt classes were concerned. I miss her, now we live so far apart, and our sew days we'd have during school vacations. We were both teachers. This was a quilt and a technique, however, that only I did. We often took the same classes. She got me into Colourwash quilts; I got her into Stack 'n Whack. In fact, I got her into quilting, period. We both were seamstresses, so it wasn't that much of a leap, nor was much persuasion needed, ha! The FQ bundle was a show special, so a pretty good deal. I loved the rich colours, wanting a Christmas-colours quilt for on our bed. This one could be on for a couple of months as the fabrics aren't Christmas motifs. I'd already bought the Buggy Barn pattern, 'Crazy About Hearts and Stars', and these fabrics would work perfectly for the cover quilt on that pattern. So after some debate, I bought that fat quarter bundle. I don't remember the fabric line, but it is one by Robin Pandolph for Moda Fabrics. I was a selvage reader from the get-go of quilting, always interested in the designers' name, the name of the fabric line, and the company. I gravitated to Moda and Hoffman Fabrics immediately when I started quilting. I am pretty sure that I got the matching backing fabric on one of my then-guild's bus trips. It is a brushed flannel, so this quilt is super-cosy. As you can see, I didn't have quite enough, so added in the green piece to make it large enough. I have always labelled my quilts. I've always been a documenter, a journal-keeping, record-keeping type of person, so this was important to me before I even knew why it is so important. Over the course of several months, once year, I wrote a "Reason Number --" blurb about the importance of labelling quilts for the guild newsletter, which is when I really learned how important it is. Love that round angel kitty label. This quilt has been used ever since I finished it (it took me a couple of years after buying that bundle), washed multiple times, and the writing still holds up well. It was written with a Pigma Micron pen. 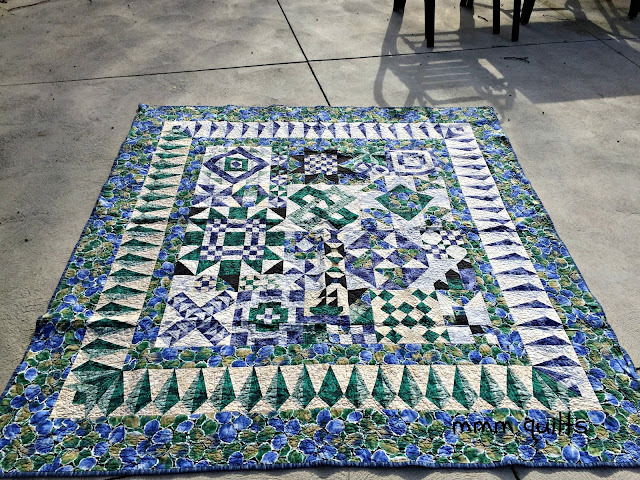 Buggy Barn Designs is known for their 'crazy' quilts, where you stack multiple layers, and whack them apart according to their block design. You sew them back together, very improv-style, where the seams won't align edge to edge, but you trim and keep going. For example, the block may start out with a 15" square, but when sewn, it perhaps squares up to around 12". I've made two of their quilt patterns and have another one out of a book of theirs on my list of "Want to Make" quilts. Here's a close-up of the actual block, a rectangle. There is no appliqué; no Y-seams, only straight line piecing. Pretty cool! I quilted it on my Bernina, FMQ-ing a heart shape in the heart and then going back over it with a wavy line, making it look rather lacy. This is a technique I learned from Kathy Sandbach's books. In each heart I did a holly design, just eyeballing it, and elongating the holly leaves to fill the star points. I had taken a couple of classes at Central Sewing in Edmonton, where I'd purchased my Bernina in 2003, one of which was on Sulky threads, so this was quilted with Sulky Blendables 12 and 30 weight in the stars and the hearts, the border a 12-weight, and either a Mettler or Gütermann, 50 weight cotton in tan, green and off-white, and a red Sulky rayon in the background of each block, matching the colours to the background. After the first wash, I realized that I should have echoed or done something to 'squash down' the background of the feather curves, but I had no clue then how or what, so I left it, and as these things go, I've never gone back in and done some closely-spaced lines or echoes. The thread for the feathers is a Sulky Blendables reds with a little blue, a 12-weight. The guy I took the threads class from said, "If you're gonna do ALL that work quilting it, use a thread that will show off your work." To make the spine, I would use a dinner plate to draw the curve of the spine with a Clover chalk rolling marker, and then echo that 1/2" away, the width of my walking foot. I would draw the longer arcs of several of the feathers to get the angles right, but FMQ the bumps. I hadn't yet learned the 'hump and bump' style of doing feathers until I took a class a couple of years later from Matthew Sparrow, (this was before he started Sparrow Studioz, now Sparrow Quilt Company) who bought Karen McTavish's longarm and had taken several classes with her. Matt Sparrow is the one from whom Kathleen Quilts got her loaner machine, and where Angela Walters taught weekend classes just last summer, and I didn't know until the day she left and I was there in Edmonton...still a tad broken up about that. They bring in big names. Waaah! Natalia Bonner is there this coming weekend... Be still my quilty heart--!! Okay, I digress. Tip: use a Topstitch 90 (I like Schmetz) and back your top tension way down, like way down. You can go here to read a former TBT post about it. 😊 Yup, I aim, not quite there yet, to have a quilt for each month on my bed. Next TBT is February 1. This linky will remain open until Sunday midnight EST. 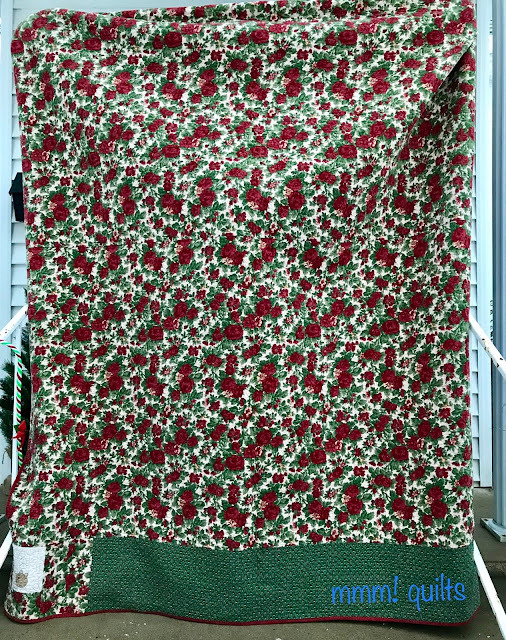 Wow, this Throwback post brings back some memories since I still have a stash of the Robyn Pandolph (my first fabric crush) Christmas fabrics plus I also made the Buggy Pattern in another fabric line--good times. You did a beautiful job of quilting, I am amazed you did it on a domestic--you are definitely brave. Thanks for hosting this linky party; it's going to be fun reading the other stories. This is such a good idea. It will be nice to see what others have to share! Buggy Barn quilts will always be favorites. One of my vintage UFOs is a BB quilt. It will be done this year, I think ;-) Actually I have three BB quilts in my UFO stack! Yikes. That probably dates me a bit too much. Haha. I didn't get a post done this week for this linky (unless I quickly do one up now), but I'll try to hop in soon! Stars and Hearts and wonderful colors. Love this quilt! Such an excellent accounting of the genesis of this quilt. I think it’s great to take the time to look back to see how much we’ve grown in our craft! Both quilts pictured here are very beautiful. That star heart block is so cool! And I love that there are no Y-seams. Thanks for sharing the history! 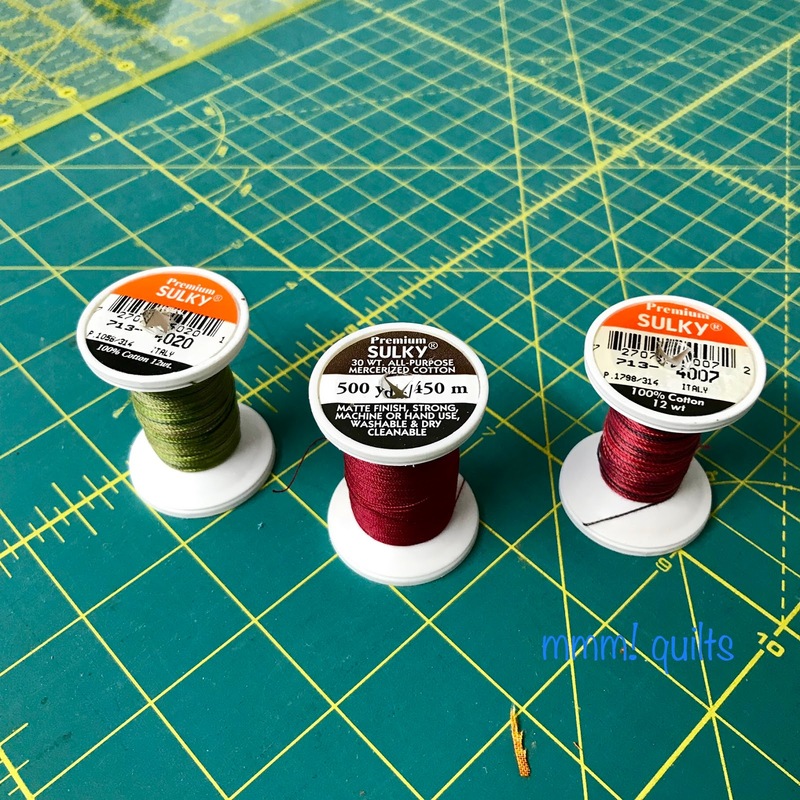 We live about 40 or 45 minutes from a quilty fabric shop, either northwards, or south, so I like to have spare roller blades, needles and thread galore on hand. Lovely to see the label and know when it was made, the pattern and more. Still very cold up your way, and down here, already, the sun is having a little lie in, and getting up those few seconds later, it all adds up to a darker start. Such an interesting and enjoyable post, Sandra! Starry Hearts is beautiful, and I always enjoy reading what you have to say about our craft. Thanks for starting up TBT again, and inviting us to join in! Love reading the story. A quilt for every month sounds like fun. I was a blogger before I was a quilter, so none of my quilts are undocumented aliens. I'll just enjoy TBT as a reader. 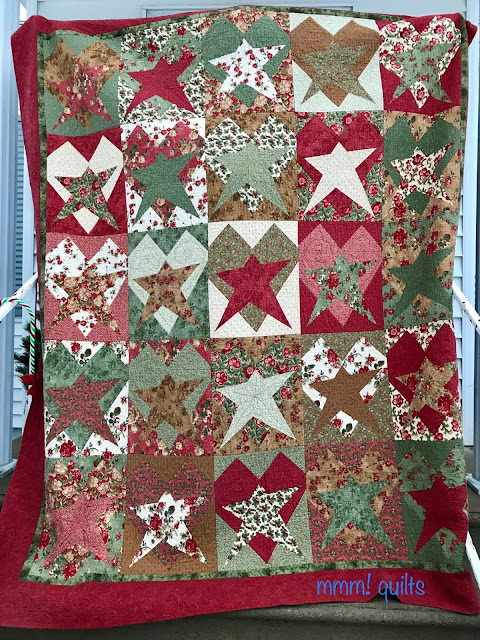 It's a beautiful quilt, love the all the reds in this one. Perfect for the holidays. I'm pretty sure I've blogged about each one of my quilts once. There aren't that many unfortunately. Oh, where do I start? There are so many things I want to comment on! First, I have done stack and whack quilts and really had fun. I especially like funky stars so your Starry hearts really tugged at me. It is a shame that Buggy Barn has books out of print. There was one in particular that I wish I had bought at a craft fair but did not (because I bought so many other things) and it is no longer available. I wish I remembered which title it was (something including Crazy perhaps? Oh wait that is just about all of them.) But since I can no longer get it it is probably good that I forgot. (See, I can ramble, too.) Second, I too am a selvage reader and often I include a photo of the edge in my blog posts. Heaven forbid there is a quilter out there who falls in love with a fabric I used . She at least needs a clue as to how to hunt for it. Third, I label my quilts by embroidering on grosgrain ribbon and tucking it in the corners on the back. Fourth, I was just at a Handiquilter club meeting today and we tried quilting with a 12 weight thread. I loved the look. So often I agonize over what pattern to stitch and then it barely shows up. But that can be a good thing because then my goofs do not show up either. Thanks for giving all your thread and batting info. I should do more of that. I usually sandwich in a bamboo batting (by Winline textiles). It is soft and drape-able and breathes just like 100% cotton. Polyester causes me to sweat. Correction - per my daughter, men sweat, women glisten. I do not spend a lot of money on high quality thread but have been very happy with Essential cotton thread by Connecting threads. Thanks for the great post and pix. Oh my, what a neat pattern. I can't even imagine how you stacked and whacked to get those two shapes together. Super quilt for the holiday season and early part of the year. The flannel back is beautiful, too. It must be really good quality to keeps its vibrancy after multiple washings. Your feathers are gorgeous with that variegated thread. 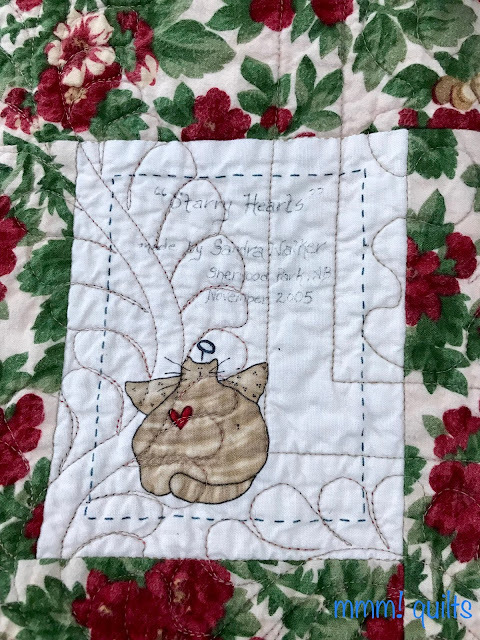 I love how you know so many details about the quilt and the materials you used, and how the quilt holds your connections to the people you were with when you made it. And the fact that you have layers of quilts on the bed that you have made and switch around. I have an extra layer on my side of the bed. I swear I don't move around at night, but inevitably the afghan starts to slide over pulling everything with it so we have perpetual blanket problems. For years. But we're still married, so it's all good. I have a very tolerant husband. If you have a tip, though, for keeping all the layers on (short of nailing them to the floor on my husband's side of the bed), I'd love to know what it is. Thank you so much for taking on this linky party. I get such a kick out of seeing what others made pre-blogging. And I missed documenting my own old quilts. I love star quilts and yours is a beauty. Love the early feathers, they are a lot better than mine ever were. Real life intruded and I didn't get my post done. At least I have a start for the next one. Do you like warm and natural? That is a great quilt with no Y seams. I love how hard it looks, but how easy it was to sew. 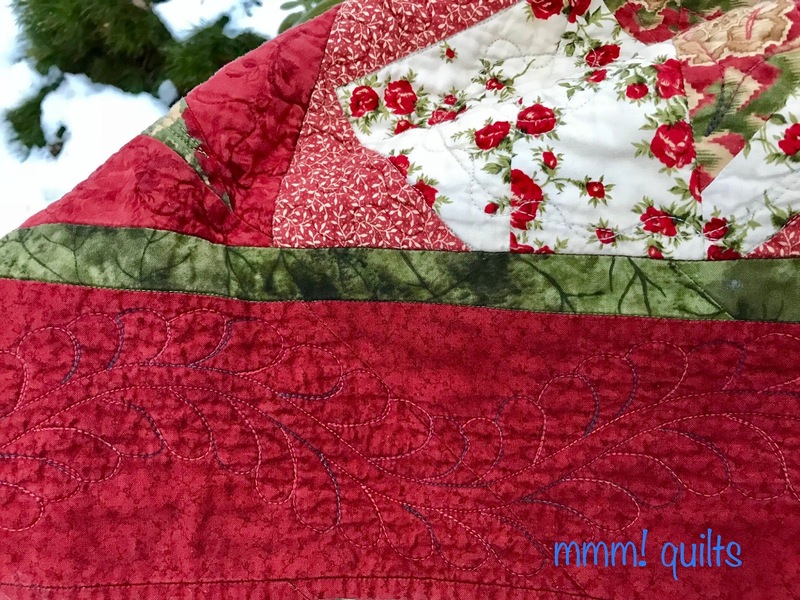 What a fun quilt - fun that it was started with a friend and fun fabric shopping! Love stories like this. very nice. I went to link up some cross stitches I did for my children's births. My husband even suggested I blog them sometime. Then I noticed, of course, name and full date of birth on these - don't think so!